About this object John Nance Garner of Texas served 15 terms in the House of Representatives, the last term as Speaker of the House. In 1932, he was elected to his first term as Vice President. On this date, for the first time in congressional history, Congress met for two Joint Sessions in one day. The first Joint Session consisted of the counting of electoral votes as directed by the Constitution. 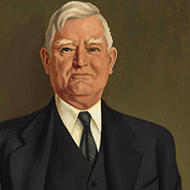 Vice President and former Speaker of the House, John Nance Garner of Texas presided over the vote count which re-elected President Franklin D. Roosevelt to a second term and, in turn, himself as Vice President. One hour later Congress reconvened in the House Chamber to receive the annual message from President Roosevelt. In congressional history, the double session has occurred three times—all under President Roosevelt. Under President Richard M. Nixon, Congress held both a Joint Session and Joint Meeting on the same day. A Joint Session requires a concurrent resolution and is reserved for presidential addresses and tabulating the Electoral College vote, while a Joint Meeting requires the unanimous consent of both chambers to recess and meet with the other legislative body. The latter is generally reserved for foreign leader addresses.